Welcome back to another season of Yankees baseball and welcome back to BP Bronx’s About Last Night series in which we will examine anything from a single at-bat or a big inning to an entire pitching performance depending on what we feel is the big story from the night before. There was a lot of buzz surrounding the 2018 Yankees heading into Opening Day. Most of it about their lineup and the two biggest guys, Aaron Judge and their newest acquisition, Giancarlo Stanton. Stanton, being the newbie, was under the biggest spotlight. He had been with the Miami Marlins his entire career and naturally, people were wondering how he would adjust to playing for a new team and in a new league. Brett Garder reached on a Curtis Granderson error in left field and Aaron Judge struck out in his first at-bat of the year which brought up Stanton. 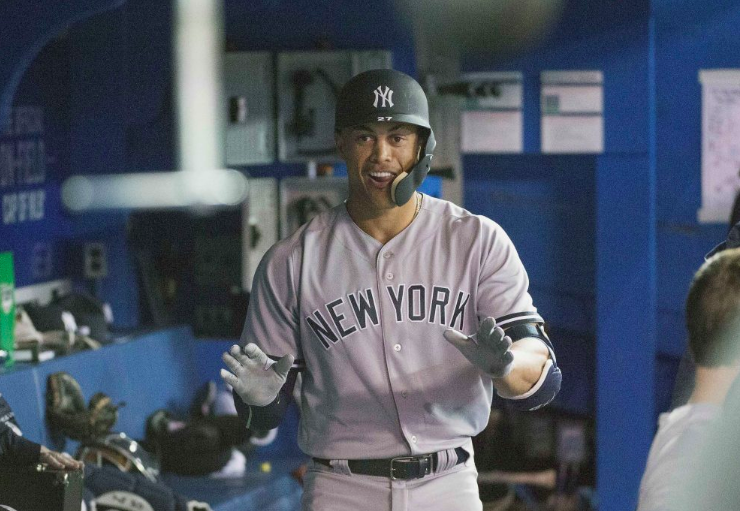 Any questions we may have had about the Yankees’ newest superstar’s adjustment to a new team and new league were obliterated just like lefty JA Happ’s 0-1 fastball was when Stanton’s bat met the ball. He sent that pitch screaming into the second deck in right-center field for his first home run of the season. The ball traveled 426 feet, at a 20-degree launch angle and it left his bat at 117.3 mph. It was the hardest hit ball Statcast has tracked to date. Read that again. Stanton hit an opposite-field home run 426 feet and it left his bat at 117.3 mph. He hit a fly ball out to center in his second at-bat. He hit an RBI double to score Judge in his third at-bat. At that point in the game, it was Stanton 3, Blue Jays 0. He struck out swinging in his fourth at-bat. Then Stanton came up with two outs in the ninth inning. The Yankees already had a commanding 5-1 lead so getting an extra run would be a luxury but Stanton couldn’t help himself. Former Yankee Tyler Clippard threw a 3-2 changeup that Stanton reached down a bit to get and he still hit it 434 feet just to the right of dead center and into the third deck of the Rogers Centre for his second home run of the day. Blue Jays center fielder Kevin Pillar didn’t even move, he just turned around to watch the ball fly over his head. Stanton seemed relaxed in his first official game as a Yankee and he got his first hit out of the way in a big fashion. Everything else is gravy, as they say. All in all, it was a successful debut for Stanton and like he said during his introductory interviews when he was first signed back in December, I feel bad for the baseballs.